Opening the floodgates for crowd surfers, metalcore sextet The Devil Wears Prada showed off their chops as devout practitioners of the breakdown. It's been a while since I've photographed a metalcore band, so I considered this set my trial by fire of the night. Followed by Saosin and Underoath, I found The Devil Wears Prada to be the easiest set of the night with regard to photography, as well as one of the most fun and rewarding. Frontman Mike Hranica on the death growl was a fantastic subject, with lots of animated action on the front monitors throughout the set. He frequently went up on the speakers, often laying a hand down on them as he doubled over in his vocal duties, which made for some great up-close-and-personal photo ops. While there was plenty of action on stage, this set felt like the most “easy-going” and manageable of the night. Some of this was owed to the number of members on stage and the relatively tight space, which limited movement and made the band's movements more predictable. I utilized the Nikon 14-24mm and 24-70mm for this set, heavily favoring the ultra-wide angles. Even with large and numerous monitors positioned at the front of the stage, there was plenty of opportunity to get in close to these guys. In addition to the stage lighting, I supplemented with one Nikon SB-600 speedlight to create more dramatic contrast and cut through the ubiquitous red wash of the performance. This flash was used off-camera and triggered wirelessly. I'd photograph these guys again in a heartbeat. This shoot was a blast, and a great way to ease into the much more frenetic sets of Saosin and Underoath. Stay tuned for those write-ups, coming up! these are amazing, u are really good at what you do! i can’t wait to see your underoath pics! Hi Stephanie, thanks for the comment. 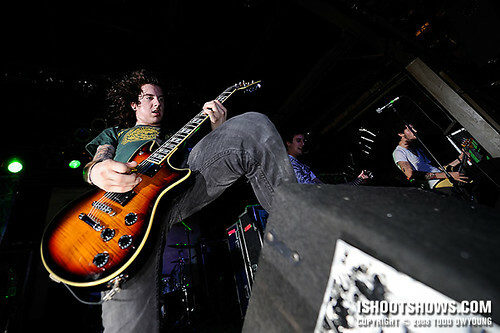 Yeah, TDWP put on a really energetic performance. At one point I believe their manager requested the photographers to leave the pit, the crowd surfers were coming so frequently (though it couldn’t have been worse than it was for Underoath). The sets for Underoath and Saosin will be coming up later this week. haha, i told you they would be fun… definately the best show i’ve ever seen them put on by far though. i’ll try to get these to mike, but he checks flickr quite often on his own so he’ll probably see them anyways. Yeah, it was a really fun show to photograph, glad to hear we caught them on the upswing. If you can send Mike a link, that would be great! Looking forward to seeing what you got, too, let me know when those are up. Sweeeet. My friend is friend’s with these guys. I’ve never really digged the music much, but it sure as hell looks like they put on one hell of a performance! This is also different from some of your other work — and I think it’s exactly because of what you said, you utilized the 14-24 to a large extent.. and MAN I love it! I think it provided great photo ops. My picks are 1, 5, 6, 10, and 12, along with this . My favorites are 1 and 10. Nice work with the lighting, too — just 1 sb600? It really looks like it cut through those ugly red washes to provide some nice complementary light. Go Pops! Hey Chris, thanks for your thoughts on this set. It seems like everyone is friends with this band. 1 and 10 are what I made public on Flickr, so those are my picks for now as well. For TDWP, I wanted to try a slightly different lighting set up, as underlighting seemed to suit the music and band better than what I’d been using in the past. I really like the wide angles. Hey Jessie, thanks. A wide angle was a necessity for this show! Excellent! I see they used an amazing on of Andy for their profile picture. Hey Jeanne, thanks for the comment! Yeah, my friend David told me the band was using a shot for their Myspace page. Glad they like the shot! SOOOOO GREAT!man, don’t know what else to say other than that haha cant wait for the others! I’ll probably post Saosin in the next hour, Underoath will probably drop late on Thursday. AH, my favorite band. You are so lucky. I wish I could have the chance to shoot them live.